Renee Jackson wanted to teach a lesson to help students when selecting and preparing evidence for a debate. We began by building upon this lesson from PBS using the documentary Herman’s House about Herman Wallace, the man who lived in solitary confinement for forty years, which is longer than any person in the United States to date. 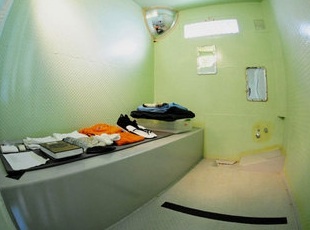 I can identify and evaluate the claims, evidence, reasoning, and emotional appeal in articles about solitary confinement. I can analyze how these factors contribute (or add to) the reliability and persuasiveness of texts. These learning targets were explained and linked to the larger goals of the lesson (to prepare students to gather research, use evidence, and refute claims in their own debates), which would come later. 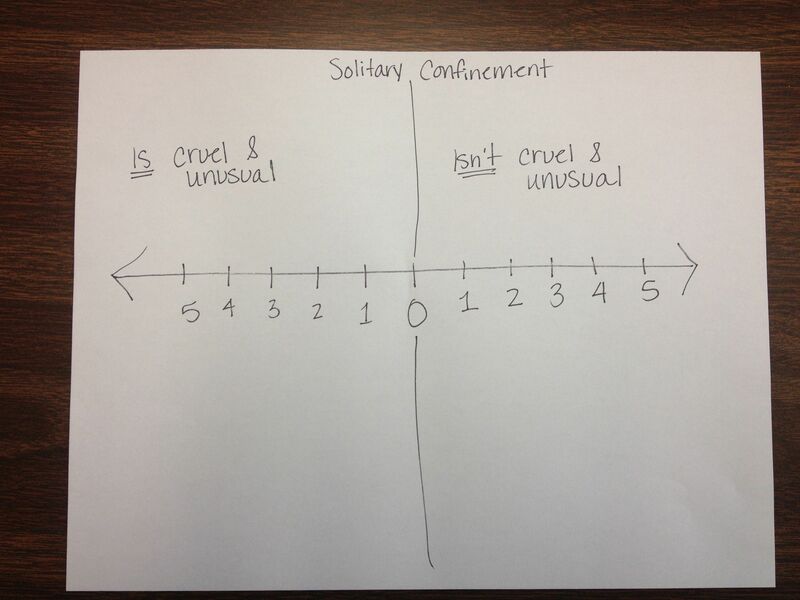 We discussed what “cruel and unusual” punishment might include, and then had students consider whether solitary confinement would be considered to fall into this category. In order to explore their thinking on this issue, students plotted their initial impression on a reflection sheet (see below). Five represented the strongest feeling and one represented the weakest. We asked students to mark a starting position and label it as “Point 1.” Then, on the chart, they had to give one reason for their position. (They did not yet have evidence.) Afterward, we used their initial thoughts as a starting point for a class discussion on the topic. The first source students examined was this clip from the documentary Herman’s House. We told students to chart a “Point 2” on their graph and (whether the clip had changed their perspective or not) and then give one reason and one piece of evidence they felt supported their new position. We shared out these shifts, focusing on the evidence and how it could be used to build an argument for one side or the other. The New York Times post was full of emotional appeal, so we had students look at the article first and then fill out one side of the graphic organizer noting the claim, two reasons, one piece of evidence for each reason, and any emotional appeals from the article. We also had students mark a “Point 3” on their reflection sheet to see if their position on the issue changed and give a reason and piece of evidence to support. Is this source reliable? Why or why not? Give one piece of evidence to support your position. On the second day, students were asked to read the article “Solitary Confinement: Punishment or Cruelty” from NPR and identify the claim, reasons, evidence and emotional appeals on the graphic organizer and plot their change (with reasons and evidence) on the reflection chart. As with the first article, they then got in groups and assessed the credibility of the source. Most classes were able to identify the source as less biased because it interviewed the wardens as well as the individuals in solitary confinement. In this way, they felt it was a more reliable source. What specific evidence was most convincing to you personally? After students answered the question, we discussed responses and asked them why this was important information to know as they prepared for their own debates. Although they struggled to make the connection, the discussion eventually revealed to them that the information he or she found most convincing would also have a better chance of convincing others, and that this is something to keep in mind when they begin their own debates. We continued this lesson with mini-debates, which I will outline in a later post.